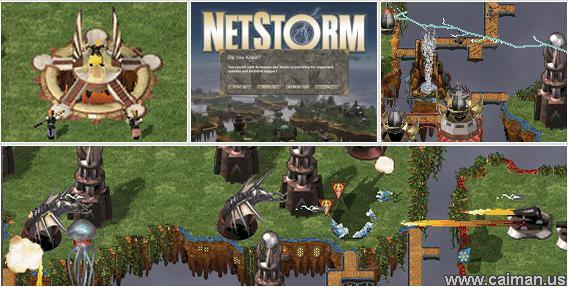 Caiman free games: Netstorm - Islands at War by Activision. 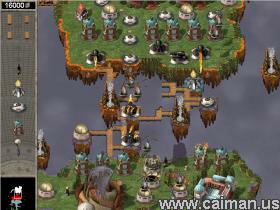 A great RTS combat game between priests in a fantasy world. - Multiplayer over the net. High in the sky there are some floating islands. On those islands the priests are building their cities. Each player controls a priest. The object of the game is to capture the opponent priest and to sacrifice him in order to get more technologies (in multiplayer mode) or to win the game (single player mode). In order to reach the opponent islands and the geysers (for resources) you can build bridges. Everything on this game is great. You can play it as well in full screen as windowed. It contains very detailed help files, it has a very good tutorial and an editor. Everything works with the mouse, but there exist many hot-keys to help quick accessing some items.